This past weekend, I finally concluded that I had too much track and not enough room for scenery in one area of the Geologically Improbable Railroad, Mountain Division, so I ripped out some marginally useful track, its roadbed and the surrounding plaster hardshell. While in the process of replacing the hardshell, it occurred to me that the method that I have settled on might be interesting to other indoor large scale model railroaders. There is nothing particularly special about the technique, but it is cheap, effective, and easy if not a little messy. 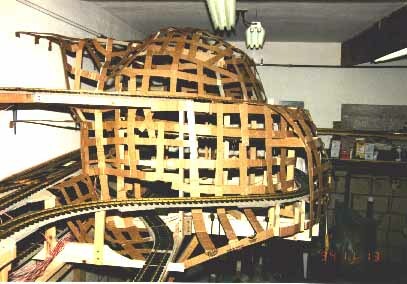 Hardshell is just that, a shell of hard material which form the base for model railroad scenery. Ideally the shell should be strong, lightweight, easy to install and inexpensive. No one method that I have seen meets all these characteristics, but for a non portable layout, a plaster shell gets close. A plaster shell can be made thin enough so that it is not overly heavy and still strong enough to support the scenery and the occasional hand placed on it for support. To make plaster shell strong enough to deal with the forces placed on it for a portable layout, it has to be made too thick and heavy to be portable. Other methods based on urethane foams are more suitable for portability, but at significantly increased expense and the risk of exposure to harmful fumes during installation. The method that I settled on after testing out several techniques that I found in various model railroad scenery books is the tried and true Hydrocal plaster soaked paper towel method. Its strong, quick, easy, has reasonable weight and there are no harmful fumes or chemicals involved. Since the method is based on plaster, some explanation of what plaster is and how it works is in order. Hydrocal (a brand name) is pure gypsum, a naturally occurring mineral. It has been ground fine and has had all the water baked out of it. Water is the key to the process. When water is added to the powered plaster, a chemical reaction is initiated where the water combines with the gypsum and releases the heat that was added when the plaster was made. The reaction proceeds until a sufficient quantity of water is chemically combined and the material sets up into a hard mass. Any excess water in the mix then slowly evaporates out. There are many different types of plasters formulated for special uses. Hydrocal is just one of them, but it is easily the strongest of the bunch. I tried several types, casting plaster, Plaster of Paris, patching plaster and others. Each has attributes that make it work better than pure gypsum plaster in some special application, however, for hardshell, Hydrocal is the clear winner for strength. It is also the most expensive at about $18 for a 100 lb bag. Plaster and gauze combinations (RigidWrap is one brand name) are easier and less messy to apply, but their strength in thin layers don't come close to Hydrocal and they are at least 20 times more expensive to cover the same area. Casting plaster is cheaper than Hydrocal and does work better for making rock molds as it tends to bubble less and it takes stain better, however it is significantly weaker than Hydrocal. Patching plaster is intended to be made into a pasty mix that can be used to patch holes in other plaster surfaces. It has a much longer working time than Hydrocal but is much weaker in thin layers. If Hydrocal has one drawback, it is short working time. It sets up VERY FAST so that you must mix small batches and work quickly. I find that I can cover less than 2 square feet in one batch. The hardshell is intended to be a scenery base, not a finished surface. Therefore it not necessary to smooth it out completely. Bumps, runs and ridges are ok. The hardshell will be covered with another layer of another kind plaster that can be smoothed and worked and provides a surface that looks more like dirt. This surface will then be painted with dirt colored latex paint and texturing materials (real dirt, ground foam, dyed sawdust or whatever) are applied over the paint. For this topcoat plaster, I use a product called StructoLite. This plaster has particulate material mixed in it. It is intended use is as a base coat for lath and plaster walls. StructoLite costs about $7 for a 100 lb bag. I have tried several methods to support the hardshell and the easiest one is to make a grid of cardboard strips that conforms to the shape of the intended scenery. The grid is made with strips about 1" wide and about 4" to 6" on center. I use hot glue to attach the strips to the underlying support and to each other. Hot glue is both quick and strong. Cloths pins are used to clip the junctions for the 30 seconds or so it takes the glue to harden. On level or nearly level areas, I also add a finer grid of 1" masking tape between the cardboard strips to keep the plaster soaked towels from sagging between the supports. I have also tried wire screen, hardware cloth, and chicken wire. I find that the wire support is strong, but harder to form to the desired shape. I also keep jabbing myself on the wire ends as I try to form the wire. I just found cardboard safer and easier to work with. Whatever the base material is, it will also need to be supported. I used wood risers from my benchwork and stapled or hot glued the strips to the risers. For smaller features, wadded up newspapers can make an adequate support, but the newspapers should be removed later as they constitute a fire hazard. To support the plaster itself, paper towels are soaked in the plaster and then draped over the support. Regular heavy duty paper towels tend to tear too easily. I use a cloth like paper towel brand called "Rags" which I found at a paint store. These are very strong and soak up enough plaster so that only one layer is needed in most applications. The blue towels that you find at gas stations work pretty well, but the blue color tends to show through. It is only necessary to overlap the towels by 1/2" or so to join one plaster soaked towel to another one placed previously. 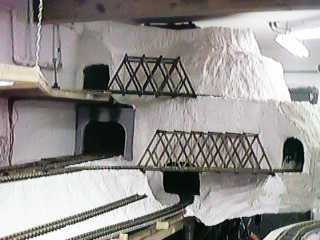 At areas nearer the front of the layout, it may be desirable to overlay them by 50% to get two towel thicknesses so that the shell can stand the extra abuse it will get during subsequent construction and operation. Mixing and using Hydrocal is fairly easy, but you need to have the proper materials ready because once you mix a batch, you have to use it immediately. It is handy to have a laundry sink available in which to mix the plaster and clean up your tools at the end of each batch. If there is no sink available then a 5 gal paint bucket partly filled with warm water will do for cleanup. Use only clean water to mix new plaster. The latex gloves are required because Hydrocal soaks up water from wherever it can find it. If you use your bare hands, it'll dry your skin to a crisp in short second. Hydrocal is mixed two cups plaster to one cup water. I use two measuring cups, one for plaster and one for water so that I don't stick a wet cup into the plaster bag. You should measure the water first and add plaster to the water, but in small batches it doesn't seem to make much of a difference. I mix the plaster with my gloved hand so that I can feel for any lumps and break them up. I then take the mixing bowl to the work area. I use only half a paper towel at a time. One batch of plaster will barely coat 4 half towels. The towel is dipped in the plaster making sure that it is fully coated and then the towel is placed on the pre-wetted supports. It is important to soak the area where the towel will be applied so that the supports and previously placed plaster doesn't soak water out of the new plaster. The plaster needs to absorb the water that was mixed in, if the water gets leeched away, the new plaster will be weak. The half towel is placed in the desired location and the surface of the towel is then smoothed with the fingers and any folds are removed. Smooth over the joints of the towel and whatever it is connecting to. You might have to dip into the bowl and get a little plaster to use to smooth the edges of the towel. Then apply the next towel. The plaster will wet and bond to practically any porous surface. When the batch is new, it has the consistency of light cream. By the time you get to the fourth towel, it will have started to set and be more like the consistency of sour cream. Coating the fourth towel will be a little more difficult and it will require more smoothing as the plaster may start to wad up on the surface of the towel. Mist it lightly with the spray bottle until you can smooth out the plaster. By this time, you will have dripped plaster everywhere, but hopefully most of it has landed on a drop cloth or newspaper. Take the bowl back to the sink and wash off your gloves and the bowl. There is a major caution here. If you just flush the residual Hydrocal down the drain, it'll set up in the drain and plug it solid in a short time. I wash my gloves and the bowl into a larger bowl in the sink so that most of the plaster settles down into the larger bowl. The overflow doesn't contain enough plaster to set up. I then flush the sink for a few seconds with water to flush the waste water past the sink trap. After a while, the bigger bowl gets a cruddy cake of plaster set up in the bottom, just pour off the water at the top and flex the big bowl over a trash can to dislodge the plaster cake. You must make sure that you have cleaned out your mixing bowl thoroughly. Any contamination, even hardened Hydrocal, in the next batch will make it set up oddly. Even though the plaster will be hard to the touch in a few minutes, allow your hardshell to set up overnight and dry completely before you apply anything over it. When wet, it will be light gray, when dry, it will be alabaster white. Mixing StructoLite is much easier, just mix it to the consistency that you want and spread it over the hardshell. Use it to fill holes and voids and to attach rock castings. Spread and smooth it to your liking, you'll have about a half hour of working time instead of the 3 or 4 minutes that you can work with Hydrocal.